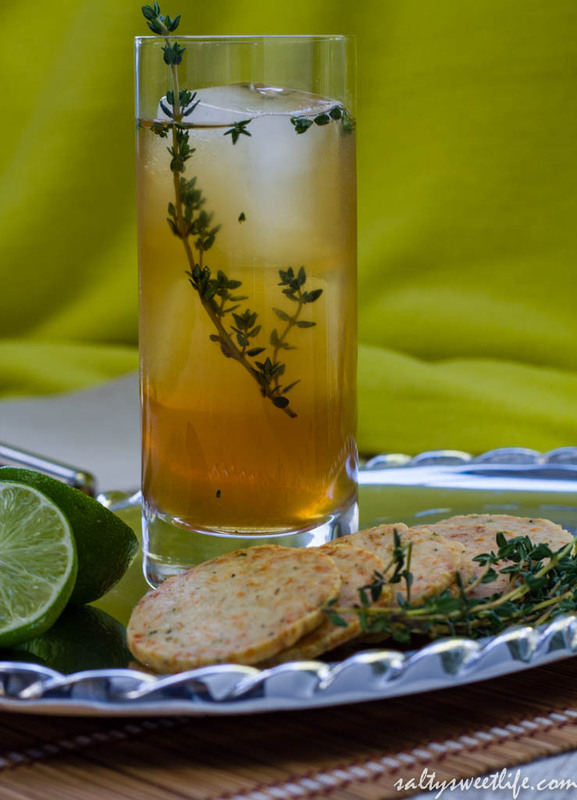 Last weekend, I planted four new thyme plants in my little herb garden, so in honor of that, I’m featuring thyme in this week’s cocktail and finger food! This was the first cocktail The Husband and I learned to make together. Inspired by that year’s winner of the 2011 Signature Spring Cocktail Contest: “No Thyme Like the Present“; it was served as the signature drink at my 40th birthday party (my, how time flies)! The original recipe is a Hendrick’s Gin cocktail flavored with fresh thyme, subtle hints of cucumber and finished with a float of white grape juice. The drink was amazing! It was cool and refreshing and perfect for an outdoor summer gathering. What I remember most was that I only had one glass of it and I was the Birthday Girl! Why do I always get cut off so early? Well, that was a few years ago, and I think my tolerance has increased a bit since then! My version of the recipe uses more gin, less juice and incorporated the herbs de Provence simple syrup that we made for last week’s Lusty Lady Cocktail. I think the resulting drink is more balanced and the simple syrup really amplifies the thyme. Hendrick’s Gin is a great choice for the original cocktail as it pairs so well with cucumber simple syrup, but I’ve used Hayman’s Old Tom Gin, which is a sweeter gin, for this one. Either gin would be perfect in the drink. Muddle one sprig of thyme in a cocktail shaker. Add the gin, lime juice and simple syrup to the cocktail shaker along with a cup of ice. Give it a few good shakes and strain into a Collins glass filled with ice. 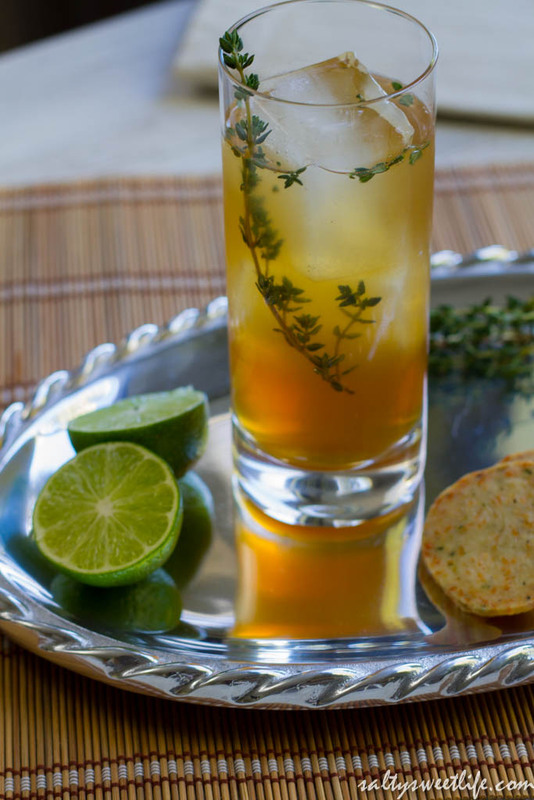 Top off each glass with the grape juice and garnish with the second thyme sprig. 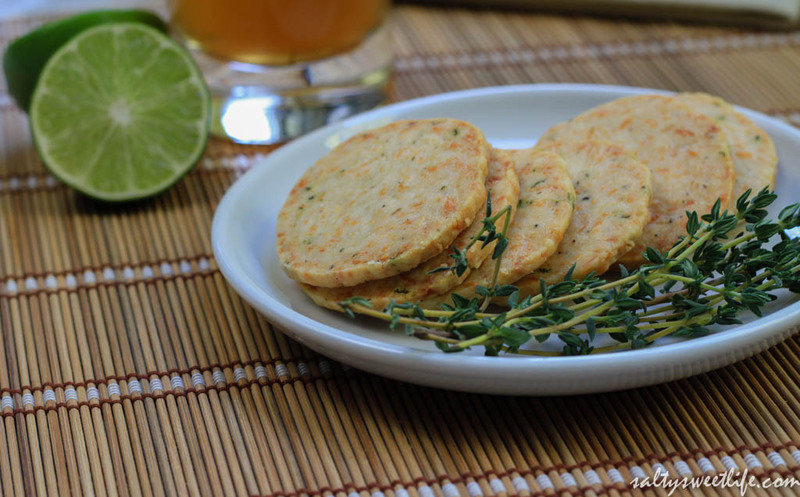 Now, if you want to really impress your friends, make these Parmesan-Thyme Crackers! I started making this crackers over the holidays last year and they were such a hit that I’ve been getting special requests for them ever since! I found the recipe in Ina Garten’s “Barefoot Contessa, Back to Basics” cookbook, which I adore. I most recently made a double batch to bring to a friend’s birthday party and folks went gaga over them! Trust me, people are impressed when you bring homemade crackers to a party! I paired them with herbed ricotta cheese and this amazing olive tapenade and let me tell you, that was an awesome bite! 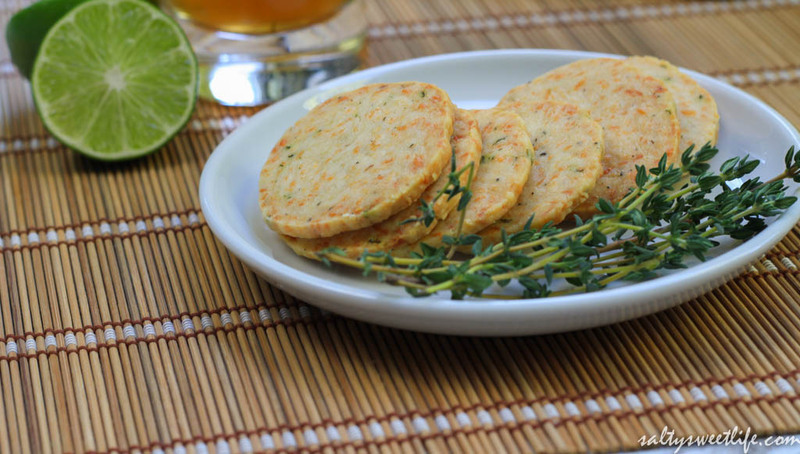 The crackers are rich and buttery and the fresh parmesan cheese and thyme just take them over the top! Perfect for a cocktail party! In the bowl of a stand mixer fitted with the paddle attachment, cream the butter for about one minute on medium speed. Reduce the speed to low and add the cheese, thyme, salt and pepper. Slowly add the flour and continue mixing until it forms large crumbs. Stop the mixer and test the dough with your fingers. If it is too dry and doesn’t stick together, add water one teaspoon at a time until it becomes just moist enough to stick together. Because I live in a desert climate with no humidity in sight, I had to add nearly 1/4 cup of water to get the dough to come together properly. Dump the mixture onto a lightly floured surface and shape into a ball, then press into a rough log shape. 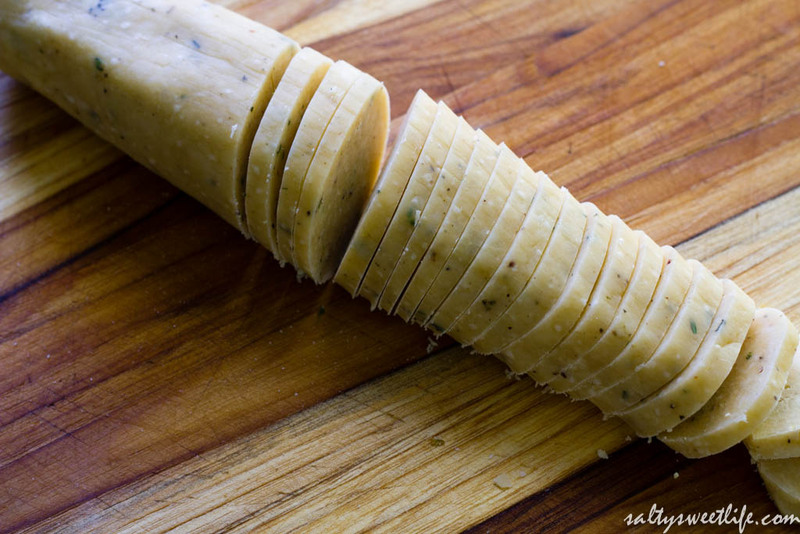 Wrap the rough log with a length of plastic wrap and carefully roll it into a more even cylinder shape. If you can get the cylinder perfectly round, kudos to you! Mine usually end up slightly squared! Twist the ends and place the log into the refrigerator for 30 minutes and up to 4 days, if making ahead. Slice the crackers into 3/8″ thick rounds and place them on a baking sheet lined with parchment paper. Bake for 22 minutes until the crackers are light golden brown, rotating the pan 11 minutes into baking. Thanks Dimple! I hope you’ll give it a try and tell me what you think! I’ll have to buy some of the ingredients soon! Will do! It looks very appealing, refreshing! It all looks SO delicious Tracey! I might have to make those crackers for my in-laws who are here this weekend. Might make for a fun Oscar-viewing snack? Thank you Ali! I think they’d be so perfect for an Oscar party! My go to is Hendrick’s and lime with either cucumber or St. Germain (or both), so this drink sounds right up my alley. Looks like its time to make some herbaceous simple syrup and find myself a little thyme plant! Hendrick’s is my absolute favorite, but my Honey has been wooing me to the Old Tom’s side. I like the flavor of both! Herbs and Gin are so great together! Thank you for stopping by Bryn! Hope you’re having a wonderful holiday! Next PostOscar-worthy Cocktails and Nosh!